The Las Vegas Bowl most recently became the Maaco Bowl Las Vegas or Maaco Las Vegas Bowl. The annual college football bowl game will now be sponsored for at least 3 years (until 2011) by Maaco, which was announced earlier in 2009. Before the name change, this post-season college football bowl game has been played annually since 1992. The Maaco Bowl Las Vegas gets to choose either the 4th-place or 5th-place Pac-10 team to meet its MWC opponent. While in Las Vegas, try out their newest buzz: The Las Vegas MealTicket- Get Breakfast, Lunch and Dinner for 1 Low price at a number of Las Vegas Restaurants! . The Las Vegas MealTicket™ is the most exciting new product for Las Vegas visitors and the best value available for dining in Las Vegas! For one low price, you receive breakfast, lunch, and dinner at any of a number of the most popular Las Vegas restaurants. And better yet, no reservations are required. The host hotel for the Pac-10 representative for the 2010 game was - again - The Venetian , also home of the Blue Man Group . The host hotel for the MWC representative often is Planet Hollywood on The Strip. The 2011 Bowl game, its 20th edition, was played on 12/22/2010 at 5pm local time (8pm EST) in front of 35,720 spectators at Sam Boyd Stadium, matching-up the Boise State Broncos from Boise State University and the Sun Devils, representing Arizona State University. This is the 2nd straight year for Boise State to play in the Bowl, finishing 11-1 overall and 6-1 in the MWC. After 2007 (Holiday Bowl), ASU returned to the Bowl again. Throughout the whole game, there was no doubt, that Boise State will be the victorious team again, raising the winning count of the MWC to 5-4 vs. the PAC-12. The 2010 Bowl game was played on 12/22/2010 at 5pm local time (8pm EST), matching-up the Boise State Broncos from Boise State University and the Utah Utes, representing the University of Utah. The game was televised on ESPN and be heard throughout the country and overseas on the Sports USA Radio Network. With six turnovers and relatively low-octane scoring output, this has been a largely forgetful game, but do take away one lesson: It's no longer safe to count on Boise State fielding a WAC defense. Not even in 2011. Highlights are a little hard to come by. The only one that really sticks out was WR Austin Pettis' pass to...himself: On a reverse near the goal line, Pettis tried to get the ball in the end-zone. Instead, it was tipped by one of Utah's defenders. From there it went right back to Pettis, who caught it and ran forward two yards. On the day, Pettis grabbed 12 catches for 127 yards with a touchdown. It was the final game of his college career, which has seen Boise win 51 of 53 games. The 2009 Maaco Las Vegas Bowl on December 22nd, 2009 featured BYU Cougars vs. Oregon State Beavers. The 2009 Maaco Bowl in Vegas attracted the game’s 5th straight sellout crowd (40,018). The 2006 game welcomed a state-record 44,615 fans. Since 2006, the Bowl gets first choice of the MWC (Mountain West Conference) teams. This would normally be the conference champion unless that team qualifies for the BCS. The Bowl gets to choose either the fourth-place or fifth-place Pac-10 team to meet its MWC opponent. The history of the bowl goes back to 1981 when it was called 'California Raisin Bowl', which was played in Fresno from 1981–1991. In 1992, the game reorganized and relocated to Las Vegas when it took on its current name. 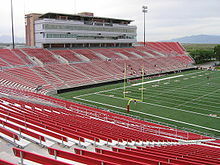 Sam Boyd Stadium is originally known as Las Vegas Stadium. The name was changed to the Las Vegas Silver Bowl in 1978 and then Sam Boyd Silver Bowl in 1984 and finally in April 1994 to Sam Boyd Stadium. The seating capacity was 15,000 from 1971 until 1977. The capacity was raised to 32,000 in 1978 and then to 36,800 in 1999. Buy Maaco Las Vegas Bowl tickets now and be one of those enthusiastic fans at Sam Boyd Stadium. Find Today's Daily Deal on the Best in Las Vegas!